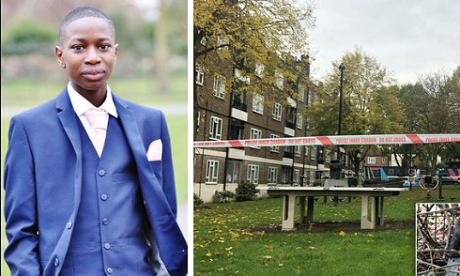 Detectives investigating the fatal stabbing of 16-year-old Nigerian John Ogunjobi, in Tulse Hill yesterday made four arrests. Four men - aged [A] 22, [B] 20, [C] 21 and [D] 23 - have been arrested on suspicion of murder and taken to custody at south London police stations for questioning. Officers returned to the scene yesterday evening, a week-on from John Ogunjobi's murder to appeal for witnesses. Police were initially called to Greenleaf Close, Tulse Hill at 22.53hrs on Monday, 5 November. Officers attended along with the London Ambulance Service (LAS) and found John collapsed in the street with stab injuries.